Upgraded Features Make the New Super Top a Cut Above! The new & improved Super Top Moka Pot upgrades Top Moka's standard Italian espresso maker with premium features like chrome knobs & handles, a diamond-treated double boiler and a state-of-the-art heat release valve for a more attractive appearance & better performance. This stovetop coffeemaker makes an impressive gift idea! 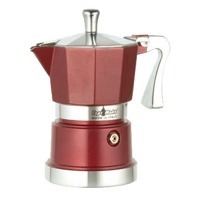 Order Your Super Top Moka Pot Today! 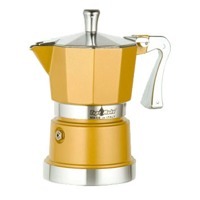 Take your Top Moka experience to the next level with the new Super Top Moka espresso maker. For an even better cup of coffee, this stovetop brewer has a diamond-treated, double-bottom boiler, chromed handles and knobs, and a precision heat-release valve for better control. 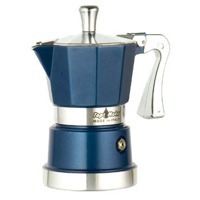 Top Moka's new Super Top Moka Pot's upgraded features and top-of-the-line quality is designed with the true Italian espresso aficionado in mind. With six designer colours and stylish chrome accents, this espresso maker will complement any decor scheme from small offices to gourmet kitchens. It's the perfect gift idea!